Create two classic bathing spots for birds in your backyard with these Gardman Verdigris Pedestal Bird Baths. These two, generous plastic baths lend bright color to your bird garden, along with classic lines and ornamentation. Both the interior and exterior of the basins sport an overlapping flower petal design, adding not only style but also texture to the pieces. Rectangular openings along each rim allow both small and large birds to perch there, and the verdigris color throughout the units adds a vivid look. Attach the included, plastic pedestal to the basin, and place this assembly on the 14.5" diameter, scrollwork base disc. This keeps the pieces stable on your deck, or the included ground pegs offer extra support if placed in soil. Crafted from plastic, these baths are both weather and frost resistant, sure to remain durable and functional for many seasons. 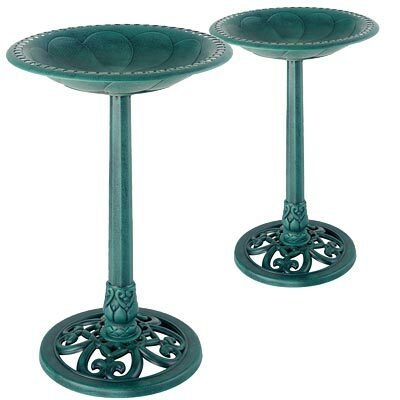 Invite several birds to gather in your garden around these Verdigris Pedestal Bird Baths. Assembly required. Note: This case pack includes 2 of the Gardman Pedestal Bird Baths, Verdigris.